The Boulevard C50C has the soul of a classic cruiser combined with V-twin performance that gives you a charge every time you twist the throttle. The Boulevard C50C’s classic design begins with the flowing lines of its kicked-out front end and pullback handlebars, which perfectly complement its teardrop tank, stepped seat and boldly valanced rear fender. These lines, of course, show off its spacious seating position, which promises a comfortable ride hour after hour. Down the boulevard or out on the highway, the C50C’s V-twin powerplant is engineered for pure excitement. With strong low-end and mid-range torque, it accelerates hard from just above idle. Yet, thanks to its advanced engineering, it’s incredibly smooth at highway cruising speeds. It’s time to discover how good a classic cruiser can be – with the 2006 Boulevard C50C. – An attractive and unique version of the classic C50 featuring new cast aluminum wheels, a special tribal paint scheme, stylish studded seat and a classic white faced speedometer with a new fuel gauge. The Suzuki Boulevard C50C offers traditional looks, modern engineering and, in turn, unmatched value. No doubt, its class-leading features and championship-winning technology – Suzuki DNA — place it many steps above the competition. 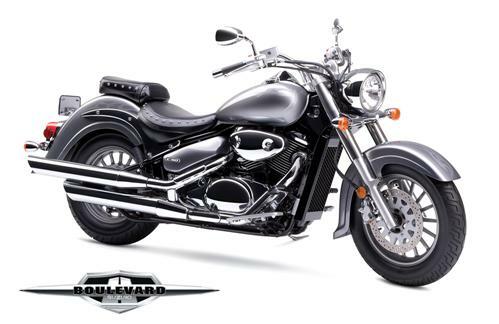 The Boulevard C50C is also the only 50 cubic inch Boulevard to come equipped with stylish cast aluminum wheels. The C50 comes equipped with Suzuki’s multi-championship-winning electronic fuel injection system. This modification brings a whole new level of performance to the 45-degree, 50-cubic-inch V-Twin engine. The Suzuki Dual Throttle Valve (SDTV) system, multi-hole injectors and 32-bit ECU from the GSX-R series provide the C50 with easier starting, improved mileage and smoother throttle response. Nostalgic styling cues include a classic 4.1-gallon fuel tank, wide fenders and a unique tribal style paint scheme. Dual staggered exhaust system, full-size floor boards with heel/toe shifter, and multi-reflector headlamp and turn signals enhance the overall package. Convenient hazard lamp and headlamp passing switches are standard. – Special Tribal paint scheme combined with a studded seat and Boulevard logo on the seat.